As an Organisation you have the option of editing the details and appearance of your LMS. The General Information menu under LMS Account and Settings allows you to adjust those, and more, settings for your organisation. The menu can be accessed by clicking on Account & Settings in the left-side menu, and then on General information. The Menu is divided into two tabs: Organisation details and Storage quotas. Once you click on General information, you will find yourself on the Organisation details tab where you can edit your Learning Management System’s settings. Plan: the type of plan you are subscribed for. 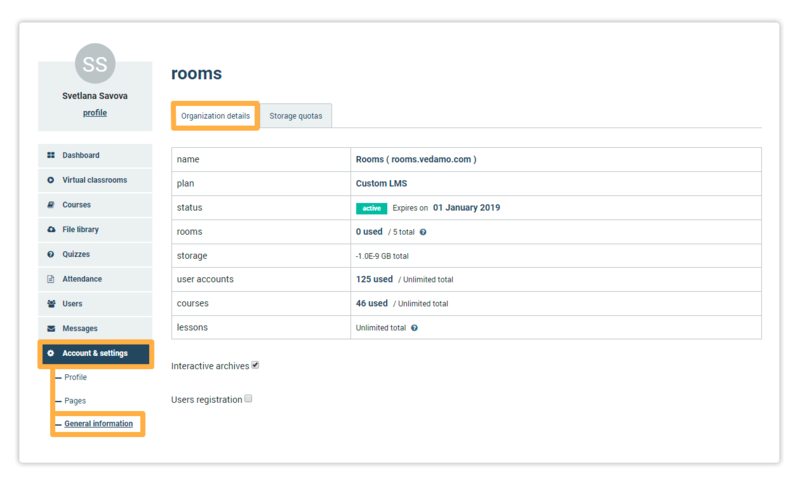 Rooms: the first number shows you how many rooms are currently open in your LMS. The second number shows how many rooms you can open at the same time. Storage: shows you the amount of storage you can use for uploading files and keeping interactive recordings of your lesson. First, you can choose whether you want to keep recordings of your virtual classroom sessions. (only available if you have purchased one or more virtual classroom licence(s)) Ticking the box means that you choose to keep the recordings. The default setting is ON. The second option allows you to choose whether users can freely register for your academy. Ticking the box means that anyone who visits your subdomain will be able to see the Register button on the home page. Visitors can click on it and then register their account. The default setting is OFF. NOTE: If you choose to leave this setting OFF, you can still create accounts for your students as an Organisation or Administrator via the Users menu. 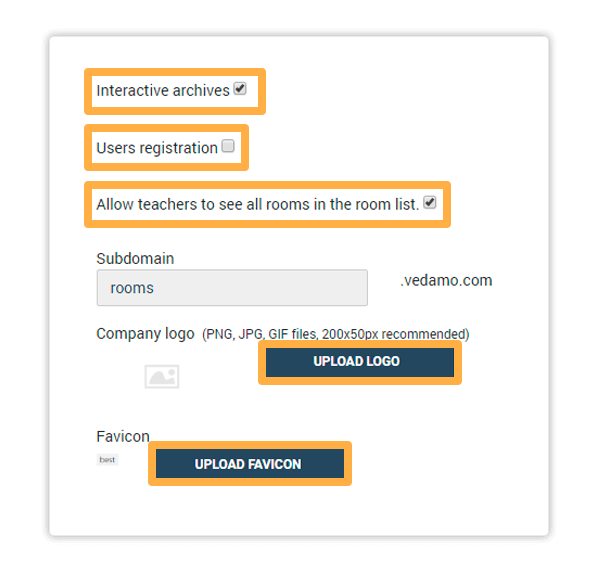 Third is Allow teachers to see all rooms in the room list. Teacher accounts normally see only rooms which they have opened when they go to the Virtual Classrooms menu, ticking the box next to Allow teachers to see all rooms in the room list lets accounts with teacher role in your academy see every room opened within the academy similar to administrator role view. Next is the Subdomain field which shows you the name of your subdomain. Finally, the menu offers nine more fields that you can use to include additional company details. Storage quotas is the second tab in the General information menu. 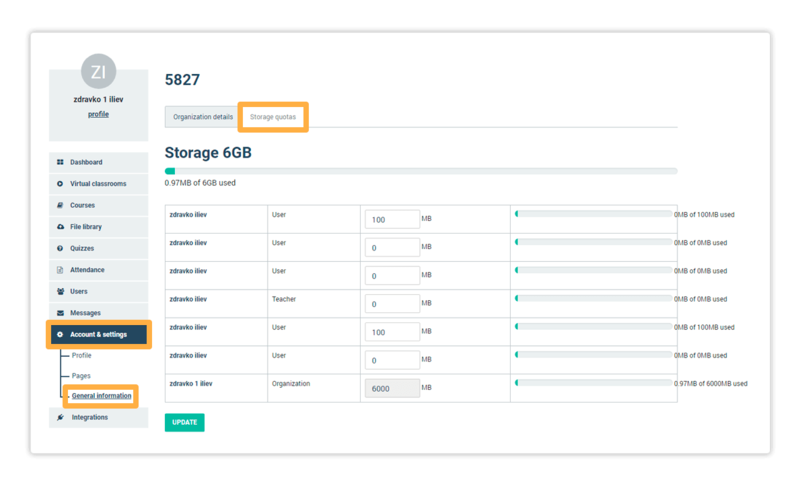 It allows you to distribute your total storage space between the different users in your academy. Your Organisation account contains the full storage quota by default. The actual size of your quota depends on your current subscription package. The Organisation account can then transfer some of that quota to teachers’ accounts as necessary. FOR EXAMPLE: In the screenshot you can see that this particular Organisation account has a total quota of 6100 MB ( 6000 MB quota + 100 MB default; every Organisation and Tutor account has a 100 MB quota by default. You cannot redistribute this). The Organisation would like to increase the teacher’s quota to 600 MB. To do that, they will need to type 500 into that teacher’s box (you can also use the up/down arrows) and then click the Update button. The teacher’s quota will now be 600 MB and the bar showing how much space they have remaining will now say 12.28 MB of 600 MB used. At the same time, the Organisation‘s storage quota will drop by 500 MB and the bar on the Organisation account’s row will state 1422.16 MB of 5600 MB.